News wires have been buzzing about a tunnel cave-in at the Hanford nuclear facility in Washington State. The Hanford facility is extremely large, 580-square miles, or about half the size of the state of Rhode Island. It produced the plutonium used in the bomb dropped on Nagasaki, and during the cold war facilities were greatly expanded for weapons production. The last reactor at Hanford was shut down in 1987, and decommissioning and cleanup operations have been ongoing since 1989. The site has been fraught with problems stemming from the storage of radioactive waste, and because of the risk of releases of radioactive material to the environment, particularly the nearby Columbia River, it is closely watched by environmental groups. 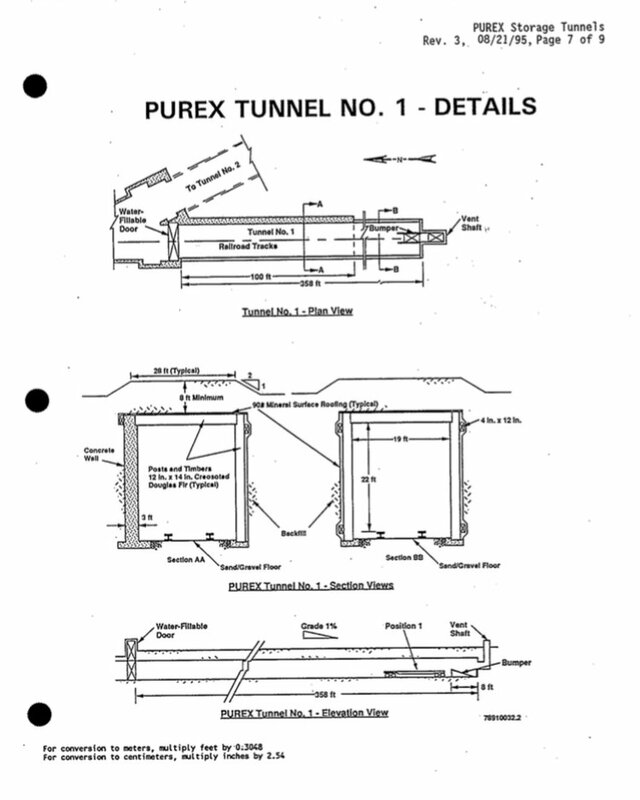 The accident yesterday involved the collapse of a small (20 x 20 foot) section of a storage tunnel built as part of the Plutonium Uranium Extraction Facility (PUREX), detected by workers on the morning of May 9th. These tunnels, constructed in the 1950’s and 1960’s, hold rail cars loaded with contaminated discarded equipment. They were constructed of wood and concrete and covered with approximately 8 feet of soil. The collapse is probably due to the degradation of wood used in construction. Railcar-by-railcar breakdown of what’s stored in the PUREX underground tunnels at the Hanford Site and how radioactive it is, c/o Stephen Schwartz‏ @AtomicAnalyst. Hanford Challenge twitter feed; this group has represented Hanford workers for the past 20 years. Because the Hanford site is so large, only very large radioactive releases can be detected off site. This makes it difficult if not impossible to verify official data regarding releases. Official reports so far have indicated that no airborne releases of radiation have been detected due to the tunnel collapse. Nevertheless, an emergency was declared, and personnel were evacuated from nearby areas of the site and required to shelter indoors in others. As of 8pm on May 9th, work had begun to stabilize and fill the opening of the collapsed section. Cheryl Rofer, formerly of the Los Alamos National Laboratory, posted an informative blog at Nuclear Diner, in which she concluded that the risk of large releases due to this accident are small. — This accident illustrates the difficulty of the cleanup of the US Cold War legacy of nuclear weapons production — the largest environmental cleanup project in the world costing over $6B a year (nearly $2 billion per year alone at Hanford) – every nation that has made nuclear weapons has hurt its own people and natural environment in the process – it further illustrates some complicated regulatory problems (lack of EPA and State authority over the site, where NRDC has long pushed for transparency). — Continued risk at Hanford is greatest from the 56 million gallons of toxic, liquid high level-radioactive waste held in 177 very large tanks some of which are leaking – this underground plume threatens the Columbia River. To summarize, this particular accident appears to be quite small and localized, but that may just be luck. In this instance, Safecast is concerned about the lack of independent monitoring at the Hanford site to confirm official statements about radiation releases. I’d call it an incident rather than an accident. I copy and paste here an update added by Azby Brown in the original post on Safecast’s blog. We will add the update directly in the post.